Toys R Us to the rescue! 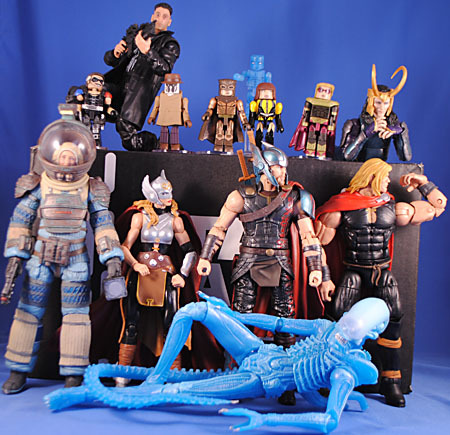 New Minimates, the more recent Aliens figures and a decent amount of Thor Ragnarok figures (pegs are clogged with Thor and Loki, and precious little else)! Okay, kids - I'm in! 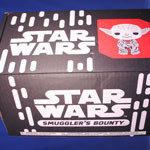 Plus... what should (and better) be my last Smuggler's Bounty box, what-what! 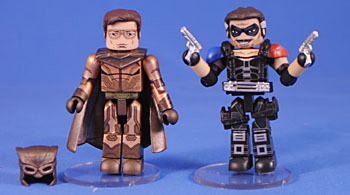 I'm not the biggest fan of Watchmen (the comic or the movie) but I do love Minimates, so here we go. This is a pretty nice set, and it's pretty neat that Nite Owl comes with alternate hair for an unmasked look (he even has his 80's glasses painted on!) but it's really surprising that we don't get an alternate head for the Comedian. Or even a shotgun or flame-thrower. But, I kinda get it - it looks like DST, wisely, wanted to keep the budget on these tight/low and went with less parts and tooling than we usually see. Still though, if Comedian had and alternate head I absolutely would have gotten two of this set (or one of this and one of the boxset). 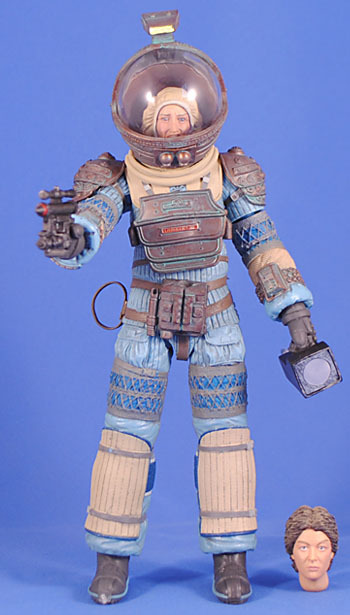 Plus, if this guy came with a flamethrower then I'd be tempted to get the Vinimate and recreate that Vietnam shot. Hmmm, I wonder... there have been a TON of Minimate weapons, but has there been a non-Alien flame thrower? Also, check this out - anything substantial missing...? Where's the Comedian's Smiley Face button!? I know it is/was copywritten, but just a little yellow dot is all we need - it's THE icon of the series! Look - I know I'm griping here a lot, there's more to write about on the negative side, but these are good Minimates and a solid set. Here's the Toys R Us exclusive two-pack to complete the core roster. 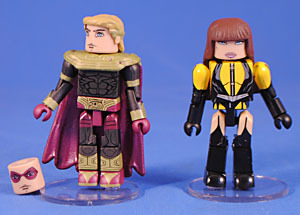 The only accessory here is an alternate head for Ozymandias so that you can have Adrian with or without the racoon mask. It really would have been nice to get something else here (an alternate head or hair for Spectre to encourage a double purchase, or even a non-articulated Bubastis) but it's fine for what it is. And what it is, is really well painted Minimates! Given the style of 'mates over the last several years I was surprised, even disappointed, at first to see how much of the costumes are just painted on... but then I realized it HAS been years since paint was favored over sculpt for intricate designs, and I gotta say this is a VERY WELCOME return to form! The paint on the bodies is all tight and clean - it looks great! It makes it seem like these are "cheaper" but then I've also heard that adding paint apps can actually be more expensive than tooling. 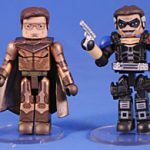 Either way, these looks great and definitely hearken back to what made me fall in love with Minimates in the first place - highlight how much can be done with just the core body! This is a surprising pairing as it's basically the two most popular characters in the team and pairing them Rorshach/Nite Owl & Manhattan/Comedian makes a bit more sense, but... I'm cool with it because these two both have alternate costume parts and make the most substantial changes between costumes - so this was a very easy "buy two" for me! 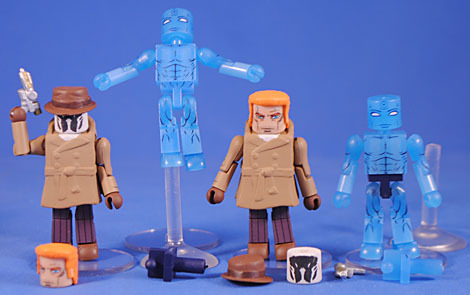 Rorschach gets what looks to be an all new trenchcoat piece for his iconic look and a new just-fedora hat (no hair). 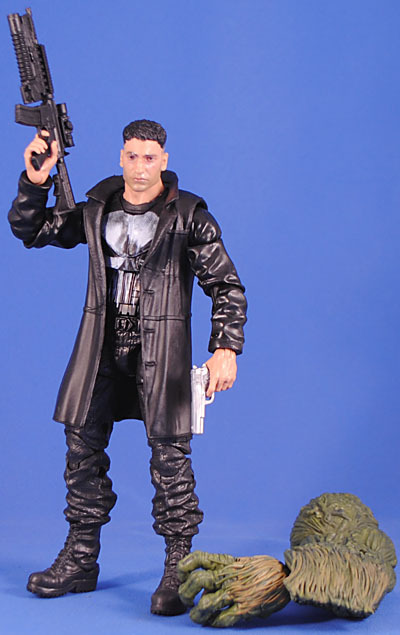 He also gets an alternate unmasked head and hair piece, but annoyingly the flipped-up coat collar in the back is sculpted with clearance for just a plain head and the hairpiece only just barely fits on. He also gets the grapple gun. The unmasked head will be lots of fun for "End is Near" and prison customs! Dr. Manhattan is just awesome - he's done in a great semi-translucent blue that's actually Glow-in-the-Dark! It's kinda dim and more green than blue, but still quite cool! BUT, guys, BUT he comes with an alternate waist piece painted dark blue... meaning... those are his trunks.... And he is buck nekkid!!! This has got to be the first collectible of naked Manhattan ever, which makes it especially awesome! He also comes with a little hover stand so that he can wag his cosmic dongle from on high. 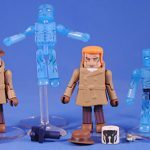 Sadly, but totally understandably, Rorschach doesn't have anything printed/painted on his torso under the coat - I really would like an excuse to buy more of these so that I could also make a Dr. Manhattan in suit, too! Woof. Man... "mystery boxes," am I right guys? It was a fad I never REALLY got, and tried a few LootCrates here and there, but them I subbed in to this thing during the great Star Wars Hype of 2015. And then those jokers auto-enrolled me in year two like a month or so before I expected them to I got stuck with several hundreds of dollars gone and more Pop! junk showing up at my door. BUT, I finally canceled the auto-enroll so this should be my last, and... out with a whimper and not with a bang. 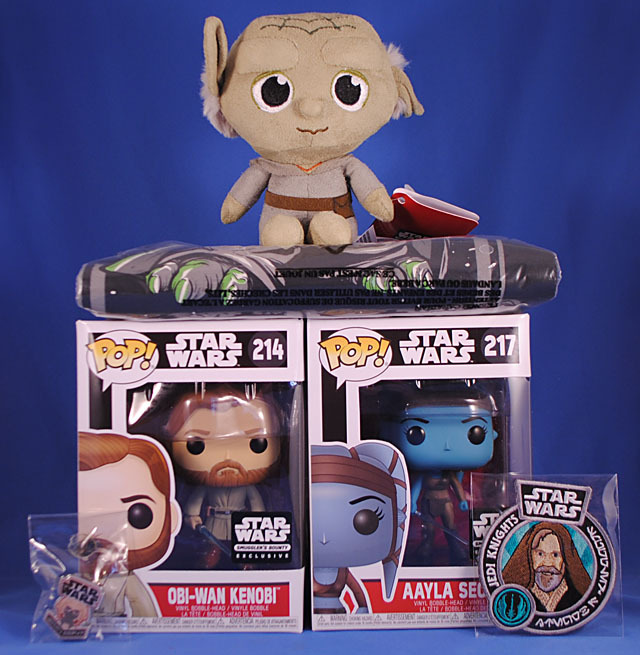 A couple prequel Pop!s, a t-shirt I can't imagine anyone wearing and a dopey Yoda plush. The best things here are the pin and patch, but it's not worth the... what? $20-$40 this costs. Oh well, I'm glad to see it go, and my friends and their kids will be glad to inherit some toys. Honestly, I was kinda disappointed when they showed this guy... just a straight repaint with no accessories or anything? But now that I have him in hand? Yeah, he's pretty cool! 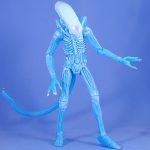 They cast him in a really nice deep electric blue plastic with a bit of translucency to it, then drybrushed and sprayed a light blue over him to bring out the details. I could do without the blue spray on the dome, but it's not a dealbreaker. This is just a surprisingly neat figure solely because of the blue plastic that used. It doesn't really photograph as cool as it is, but imagine an Alien figure that looks like it's made out of the blue raspberry DumDums candy. It's cool and I kinda want to eat it! Laaaaaambeeert! Laaa-aaa-aaaa-aaamb-ert! And thus, our Compression Suit trifecta is complete! Lambert uses the same body we've gotten with Kane, Dallas, Ripley and Amanda Ripley, but now with a pastel blue coloring. Like Kane and Dallas she comes with the removable helmet, gun and flashlight, but unlike them she gets and alternate head! I appreciate the inclusion, but given that I don't have an un-capped Dallas I don't really need an un-capped Lambert. Likewise, it's annoying that her capped head is "expressive" while the hair-out one is "generic." 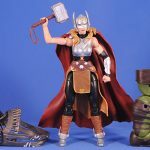 Hey... the inevitable figure of hit® new® character Don't-Call-Me-"Lady Thor"-Just-Thor Lady Thor! Man, how annoying is it when "they" role out these gimmick character relaunches then get bent out of shape when the public sees them as the gimmicks they are. But whatev's - this is actually a really neat figure! She's a good mix of new tooling and reused parts with surprisingly nice sculpting and pretty clean paint. I really expected to dislike the figure but honestly I'm digging her. The cape is great, as is the skirt, and marbled silver plastic on the helmet and armor have a surprisingly authentic vibe. Plus, despite all those new pieces, she can actually stand on her own! 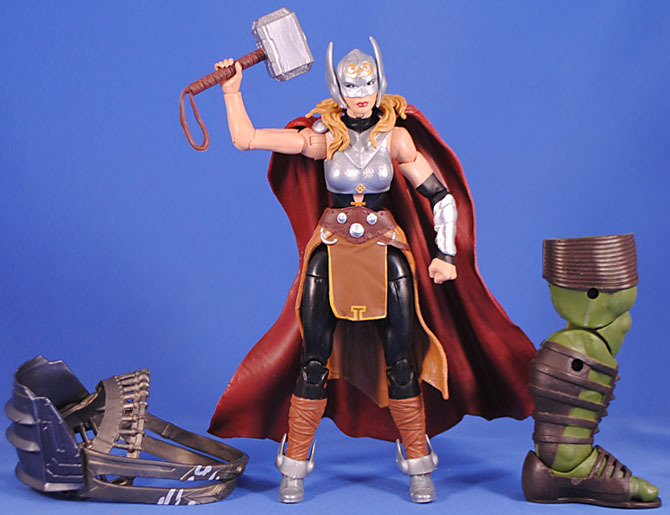 She comes with Mjolnir, of course, though it does appear to be the movie version. She also gets Build-a-Hulk's leg and pauldron-armor. That's a surprising amount of plastic packed in this one package as compared to many other Marvel Legends figures! Yeeeeeeee-awn... Since they just made Thor a woman "actual" Thor presumably could no longer actually be, you know, himself, so... here he is in a black leotard. Because... that's cool. 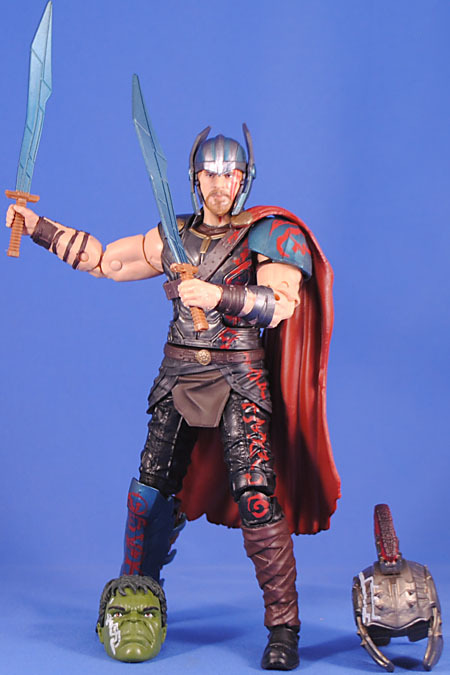 I do dig that's called "Odinson" and the tattered cape and axe are neat (I thought the axe was reused from the old King Thor BAF, but it appears to be new) and at least they used proper/sculpted boots for him, but otherwise... this is just a remarkably bland and boring figure. But ya gotta get him... He comes with Build-A-Hulk's torso. Man, the first three or four episodes of Daredevil Season 2 that introduced Bernthal as Frank Castle were damn good! Thus, I'm quite pleased to get this figure! The sculpt is all new and pretty good, and his new trigger-finger hands hold the weapons remarkably well. The skull is painted on well enough, but I must say I was very let-down to see that we're doing spray-paint skull yet again. 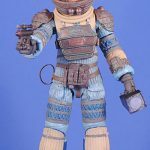 The head is good - it likely uses that new scanning process Hasbro hyped at SDCC. The sculpt is remarkably good but the paint is weird... very pixelated and grainy. So... not quite there yet, fellas. But still better than what we've seen before. This is a surprisingly good figure - great sculpt and paint! I was surprised that the "fins" on his helmet aren't articulated, though - I expected them to but on hinges so they could tilt forward or backward like in the teaser trailer. My only complaint, though, is that his cape is a separate piece and its pegs that attach to the shoulder and, especially at, the waist are kinda short so it comes loose kinda easily. 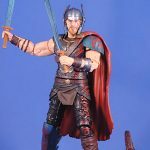 Other than that, though, this is great Thor figure! 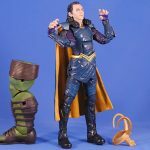 The blue armor on his right leg is removable and he comes with two swords and Build-A-Hulk's head and helmet. I've said it before and I'll say it again - I do NOT get the popularity of Hiddleston-Loki! But, here is yet again, probably shoehorned in once more. 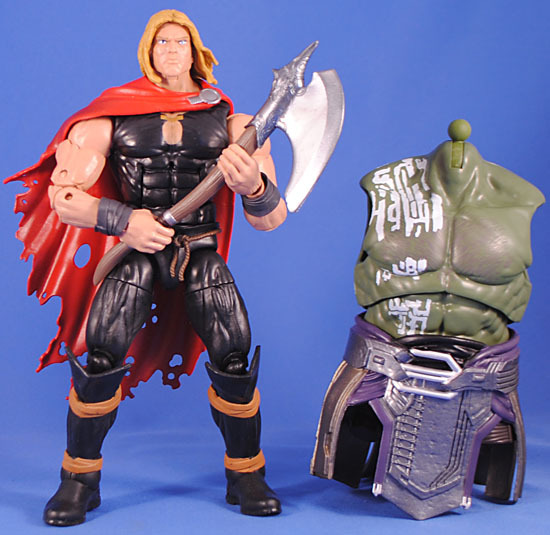 While they technically made a figure of him from the first Avengers movie, that one was a Walmart and Europe exclusive so this is essentially the first 6" toy of this guy widely available... and it, like Thor, is a great figure! 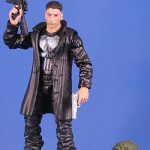 A great sculpt, a great likeness (though it was the same "soft" paint as the Punisher) and amazing articulation. But... just an ugly costume. The colors are just... they're not very complimentary and it's so... weird to see Loki is so much blue... But if you can get over the ugly costume this is a nice figure. I mentioned his articulation, and I just need to point out that his torso hinge is so good he basically can bend forward AND backward to 90 degrees...! My only problem with this figure is that his cape doesn't fit him. The shoulder pads are about a quarter inch too wide; they even come with pegs to plug into his shoulder but I could only get one in at a time. On the plus side, though, he comes with a removable crown and looks reasonably good with it on. 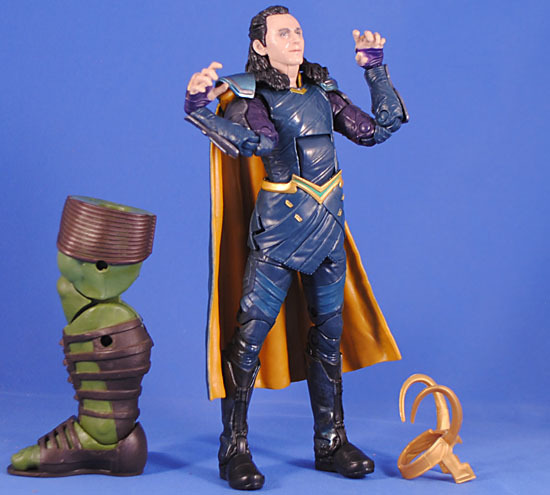 Plus, there's the Build-A-Hulk's left leg you'll want too. This entry was posted in Rustin's Spoils of the Week and tagged Alien, Star Wars, Thor, Watchmen. Bookmark the permalink.